Minister of Rehabilitation and Prison Reforms D.E.W Gunasekara told the Sunday Times the Prisons Department had taken steps to isolate prisoners who have been charged with narcotics related-offences by relocating them to prisons which have facilities for rehabilitation. The move comes as a sequel to the recent prison riot at the Welikada jail. He said the Ministry had decided to place prisoners charged with drug related offences in prisons at Weerawila, Pallekale and Thaldena in Badulla. These reforms come as part of a plan to curb the profileration of narcotics within prisons and prisoners operating narcotic distribution networks within the prisons. The Ministry intends implementing the plan by December. In the meantime the Criminal Investigations Department (CID) is understood to be still conducting investigations into the November 7, Welikada jail riot where 44 police officers who conducted an unauthorized raid in the prisons premises were assaulted by over 2,400 high profile convicts. Prisons officials who did not want to be identified speaking to the Sunday Times said investigations carried out by the Department into the riot had been concluded and the report was being finalised. The report is expected to be handed over to the Minister of Rehabilitation and Prison reforms D.E.W Gunasekara in the near future. 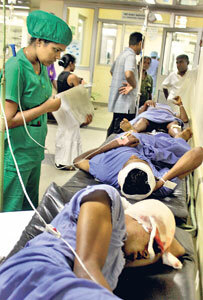 Minister Gunasekara said, in future police would need his permission, if they wanted to search the prisons. “Even if the police obtain a Court search order it will not be sufficient since they will need my permission as well. It is their duty to inform me before conducting any raid in the prisons,” the Minister said. “I do not want a repetition of what happened at the Welikada prison ever taking place again. If such a situation occurs, I as Minister will be held collectively responsible and answerable. “Once the police contact me, I will provide them with all the support and security they need to conduct a raid,” he said. The Minister added the department had identified prisons in Colombo as venues where inmates operate narcotic distribution networks while being in prison. The Minister vowed to break the intra-prison drug operations. “Our internal investigations have revealed a majority of drug dealers who have been netted operate mainly between Chilaw and Colombo. “While imprisoned in Colombo, these persons are able to peddle drugs both inside prisons as well continue feeding their networks within the city.” he said. “We found that several drug lords currently in prison continue operating drug networks while imprisoned. “By relocating these individuals to areas outside Colombo, we have been able to break the link between them and the drug peddlers. “In this manner we hope to halt the spread of narcotics within prisons,” he said. “Over-crowding in prisons is also a cause for drug addiction among criminals” he said. “By segregating prisoners who are convicted of narcotic-related offences from other prisoners we are ensuring these prisoners too do not become drug addicts. Forty percent of prisoner’s held island-wide have been charged with narcotics-related offences,” he said. “The Government Analysts report on a large number of them has yet to be received. We are now discussing this matter with the Government Analysts Department to speed things up,” he said.